How Do We Hear ? Your ears are extraordinary organs. They pick up all the sounds around you and then translate this information into a form your brain can understand. One of the most remarkable things about this process is that it is completely mechanical. To understand how your ears hear sound, you first need to understand just what sound is. An object produces sound when it vibrates in matter. This could be a solid, such as earth; a liquid, such as water; or a gas, such as air. Most of the time, we hear sounds traveling through the air in our atmosphere. When something vibrates in the atmosphere, it moves the air particles around it. Those air particles in turn move the air particles around them, carrying the pulse of the vibration through the air. Those vibrations travel through the air in the air pressure creating sound. The outer ear is the part of the ear that we can see or feel and it directs the sound waves into the hearing part of the ear. It is made of cartilage and soft tissue, and is also known as the pinna. It plays a minor role, but its folds help amplify certain sound frequencies and allow you to determine where a sound is coming from. It collects sound and you might sometimes see someone cupping their ears while listening which further helps to collect sound. 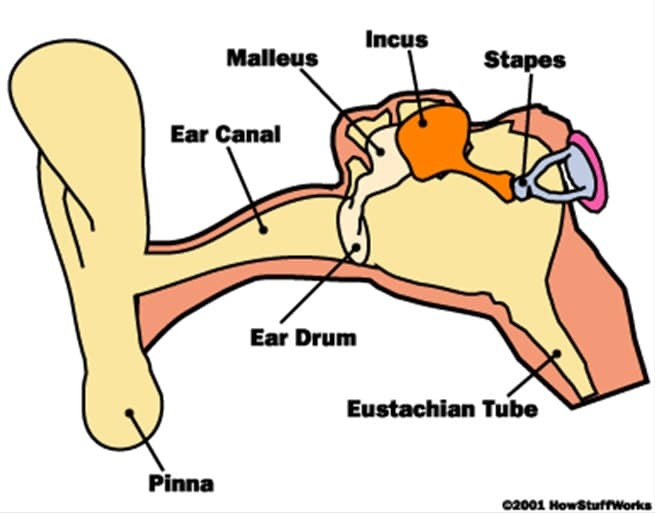 The ear canal goes from the outer ear or pinna down to the eardrum. 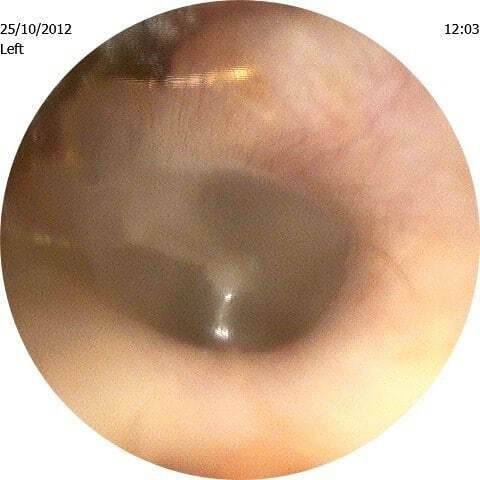 This ear canal is about an inch in length and helps make sound louder, clearer and deeper. 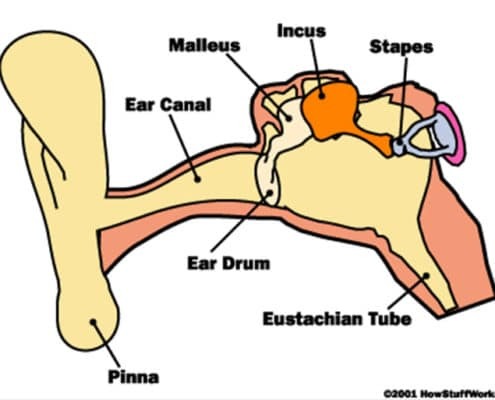 The middle ear is made up of the eardrum and three bones. The human eardrum is a stretched membrane, like the skin of a drum. After the sound vibrations hit your eardrum, a chain reaction is set off. 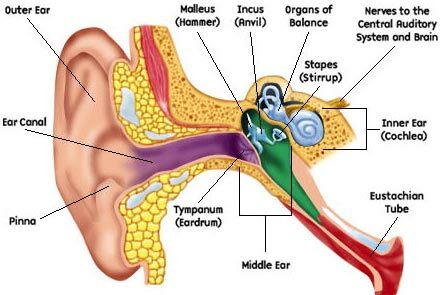 Your eardrum, which is smaller and thinner than the nail on your little finger, sends the vibrations to the three smallest bones in your body. First there is the hammer (malleus), then the anvil (incus), and finally, the stirrup (stapes). These are also know as the ossicular chain. They link the eardrum to the inner ear and are very important in our ability to hear. When your eardrum vibrates it causes these little bones to vibrate aswell. This then delivers these vibrations to the useful fluid found within the inner ear. The inner ear has two parts. The vestibular and semi circular canals are the part that has to do with balance. Each contain hair cells hair cells covered by a gelatinous membrane. Motions of the head cause a pull on the hair cells, stimulating the vestibular nerve, which signals the position of the head with respect to the rest of the body. The other, the cochlea, plays an important role in hearing. The cochlea is coiled and shaped like a snail shell. It is also filled with fluid. 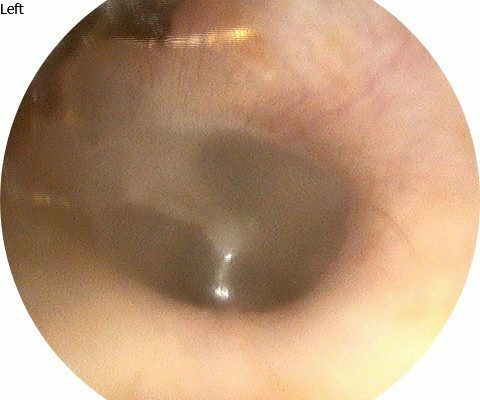 When the tiny bones of the middle ear vibrate, they push a membrane-covered hole between the middle ear and the inner ear, called the oval window, which makes the cochlear fluid move. Movement of the cochlear fluid affects hair cells in the cochlea. The hair cells respond according to what sounds come in to the ear, creating signals that become nerve impulses. These nerve impulses are carried to the brain by the acoustic nerve to auditory processing centre within the brain. A central auditory system handles the processing of the sound, so that we can understand the differences between sounds. From this point on, further auditory processing takes place in the brain. This processing helps people interpret sounds, such as speech, correctly.